This book traces Winston Churchill’s early years, from his birth at Blenheim Palace through struggling miserably at school and his entering Sandhurst military college after his third attempt to pass the entrance examinations. It follows the young man’s ambitions to excel as a soldier in?India and in the Sudan, finally arriving in South Africa as a war correspondent for the Morning Post. Churchill being taken POW in Natal and his imprisonment at the State Model School in Pretoria is described in detail, including his attempts to be released as a non-combattant officer until he manages to escape, leaving two of his comrades behind, by climbing over a fence. His subsequent adventures on a mine compound in Witbank, his day and a night hiding in an underground stable in a coal mine, and his insistance to be rather recaptured by the Boers than spending another night in the rat infested place is described in detail. His flight to Lourenço Marques, the author scrutinising his encounters on the train that took him to Portuguese East Africa, the strange incidents there and being received as a hero by the British when finally arriving in Durban make fascinating reading. The author relates many incidents reported by Churchill during the subsequent months before he entered Pretoria with Lord Roberts’ troops and by carefully analysing these, he provides evidence that they could not have happened as they were presented by the writer. One of the most startling aspects authors on Churchill tend to ignore is the fact that the “£25 warrant of arrest” he presents in his book, My Early Life, as a poster issued by the South African military authorities, was written as a kind of joke by a Dutch individual named Lod de Haas. Bolsmann exposes the background to this meaningless note that was later blown out of all proportions in minute details. 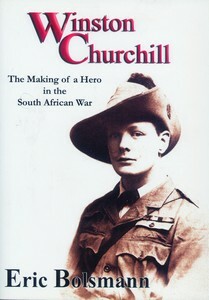 Winston Churchill – The Making of a Hero in the South African War was published by Galago Publishers in Alberton, South Africa, as a 268-page illustrated soft cover edition in 2008.